The thick, succulent leaves of the Malabar spinach vine, Basella alba, are among ECHO’s favorite vegetables to grow during our hot, humid summer which mimics that of the tropical lowlands. Native to tropical lowland regions of Asia, this short-lived perennial vine tolerates high temperatures and heavy rainfall with few pest and disease problems. The International Institute of Rural Reconstruction (IIRR) reports that Malabar spinach grows well at up to 500 meters in elevation in the Philippines. 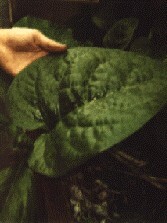 A large leaf of the Bangladesh variety. At ECHO, we regularly eat the leaves and young shoots of the plant and know from literature that the purple juice of the tiny fruits is sometimes used for food coloring. We knew of no use for the seed until Jim Dressner wrote to us from Bangladesh. He had received seed from ECHO and compared our variety to the local Bangladesh varieties. “In comparison with the local varieties, [ECHO’s variety] is less vigorous, with less overall production and smaller leaves. The local varieties are much better as a cash crop, where large periodic harvests are desired. In contrast to local varieties, [ECHO’s variety] blossoms/seeds continually; as Bengalis enjoy eating the blossoms/seed, this is a positive point.” Dressner also sent us some simple recipes containing Malabar spinach leaves and seed. Write to ECHO if you would like copies. Malabar spinach is a relatively good source of vitamin A, vitamin C, calcium, and iron, though it has proportionally less protein than many other leaf vegetables. Harvesting can begin after the first month of growth. Two types of the species exist, one green-leaved and the other with a red tint to the leaves and stem (sometimes designated as a separate species, Basella rubra). 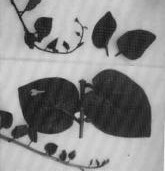 Top: Leaves/stem of ECHO’s red type. Bottom: Bangladesh type. Jim sent us seed of a local variety. What a surprise! Its leaves must be three times as large as any variety we have seen before. Another major difference is that it produces many branches at the base. It remains to be seen if it will set seed at our latitude; perhaps when days become shorter. Plant Malabar spinach in partial sun. Propagation is done by seed or stem cuttings. While not a strong climber, the plant does better with support than when sprawling on the ground. Sandy loam is reported to be the best soil type for the plant. If you cannot find seed for Basella alba in your region and would like a small packet of seed for experimentation, they are available from ECHO’s seedbank. Trial packets are free to those working with small-scale farmers in developing countries. Specify the variety you would like: ‘red seedy type’,'common green’, or the 'Bangladesh local variety’ (to be sent when/if our plants set seed).